Kazuo Ishiguro Wins Nobel Prize In Literature : The Two-Way Kazuo Ishiguro was 5 when his family moved from Japan to Britain; he has said that as a kid, he used TV Westerns — like Bonanza and Wagon Train -- to help him learn English. Kazuo Ishiguro, seen here in 2010, has won the 2017 Nobel Prize for literature. The Swedish Academy has chosen Kazuo Ishiguro as the winner of the Nobel Prize in literature Thursday morning, in an event that began at 7 a.m. ET. You can watch it online. The academy's citation for Ishiguro said he is a writer "who, in novels of great emotional force, has uncovered the abyss beneath our illusory sense of connection with the world." 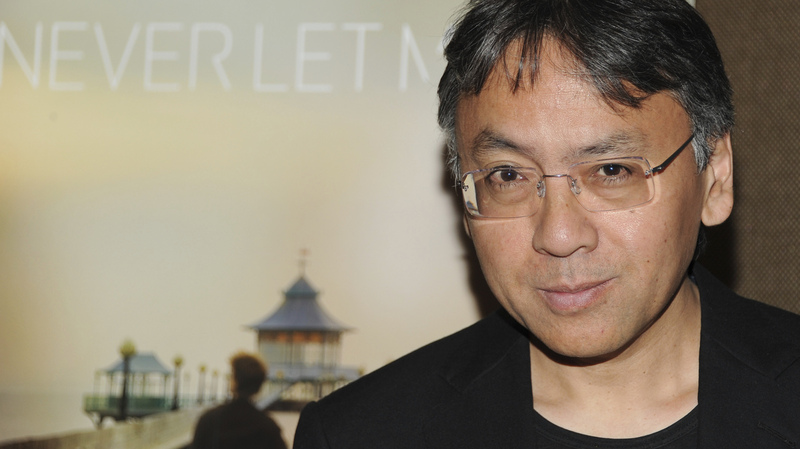 Ishiguro, 62, is a British novelist who was born in Nagasaki, Japan, and whose family moved to Britain when he was 5. He has said that as a kid, he used TV Westerns — like Bonanza and Wagon Train -- to help him learn English. Ishiguro's most well-known work is likely The Remains of the Day, a 1989 novel about an English household in the 1930s that was later adapted into a feature film. Ishiguro is also famously adept at working in a variety of genres; his sixth novel, Never Let Me Go, brought elements of science fiction into a story that centers on a private school in the English countryside where, as NPR reported in 2005, "nothing is as it seems and the horrible truth is slowly revealed." "If you mix Jane Austen and Franz Kafka, then you have Kazuo Ishiguro in a nutshell — but you have to add a little bit of Marcel Proust into the mix. And then you stir, but not too much, and then you have his writings. At the same time, he's a writer of great integrity; doesn't look to the side. He's developed an aesthetic universe of his own." Ishiguro beat out 194 other candidates — but if you're wondering who those other writers are, you'll have to wait 50 years to find out. That's how long the Swedish Academy waits to reveal that information. In January, the body will release the numbers from the 1967 prize (see the archive). In 2015, Ishiguro published what was then his first novel in 10 years: The Buried Giant. In it, he focused on an elderly couple's road trip in post-Arthurian England to explore themes of memory and loss — on both personal and societal levels. "I did take a creative writing course, yeah, 30 years ago. And it was the first one ever in Britain. And the whole point of it was that there was no teaching. It was 12 months in which to discover whether or not one really was a writer. I went there with no great illusions that I was a writer, but when I arrived I was wanting to be a singer-songwriter. "I think there's a part of me that's always remained a songwriter, even when I'm writing fiction. And I can see there's a big overlap between the songs I was writing when I was young and the stories I went on to write. Many of the key aspects of what you might call my "style" as a novelist, I think, derives from when I was a songwriter." The literature Nobel has always been a tough prize to predict. Many were surprised when last year's award was won by Bob Dylan, who became the first person to win who's mainly known as a singer and songwriter. As of Thursday morning, the betting service Ladbrokes listed the top three bettors' choices as Canadian Margaret Atwood (with 7/2 odds) Kenya's Ngugi Wa Thiong'o (at 4/1) and Japan's Haruki Murakami (5/1). Atwood: "It's been quite a year for Margaret Atwood," Lynn says. "A television adaptation of her novel The Handmaid's Tale was a huge success and the book, first published more than 30 years ago, is back near the top of best-seller lists." Murakami: "Tufts University Professor Hosea Hirata says Murakami has one thing that might be working against him: his popularity. 'His books sell phenomenally, it's like Harry Potter,' Hirata says. Lynn, adds, "And literature Nobels often go to writers with strong political messages." When Dylan won last year, he also became the first American to win since Toni Morrison in 1993. The Swedish Academy said Dylan was being recognized "for having created new poetic expressions within the great American song tradition," as NPR's Colin Dwyer reported. The winning writer is chosen by the Nobel Committee for Literature — six people who are elected from the Swedish Academy to serve on the panel for three-year periods. The academy notes that the committee is "assisted by specially appointed expert advisers."